Summer is on its way out the door. And that means goodbye to all the colorful dishes and hello to pumpkin and sweet potato. But summer isn’t gone yet, so I’m holding on to it for as long as I possibly can. That’s why I decided to go for sausage and peppers for dinner tonight. I mean, who can resist a plate full of colors? So I went on a hunt for the perfect palette of peppers. A few weeks ago my husband and I moved to Brownsburg, Indiana. It’s a suburb of Indianapolis, but it’s got more of a town feel–which I love. We are super close to a number of farms and that means fresh produce all the time! On my exploration of the city, I found a place called The Hayloft. It’s not a traditional farmer’s market. It’s a farm-to-table store with locally grown fruits, veggies and herbs. They also have fresh eggs, meats, cheeses, honey and infused olive oils. And it’s all local. I seriously felt like I hit the chef’s jackpot. 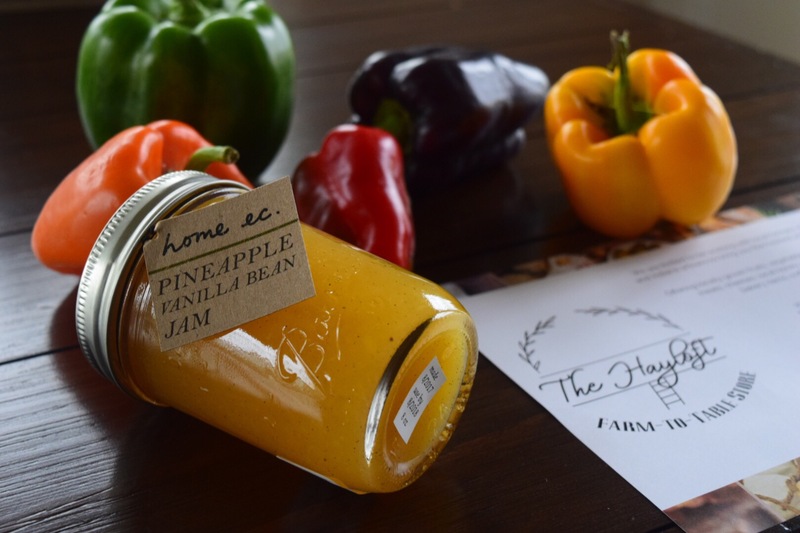 Checkout this locally made pineapple vanilla bean jam I found. The Hayloft had some amazing Bell and Lipstick peppers to select from, all fresh and ripe for the picking. I even found a purple one. It was gorgeous! The color cooked away and it became more translucent in this dish. Next time I’ll reserve the purple pepper for a summer salad rather than cooking it. That way I can enjoy the color when it’s served. 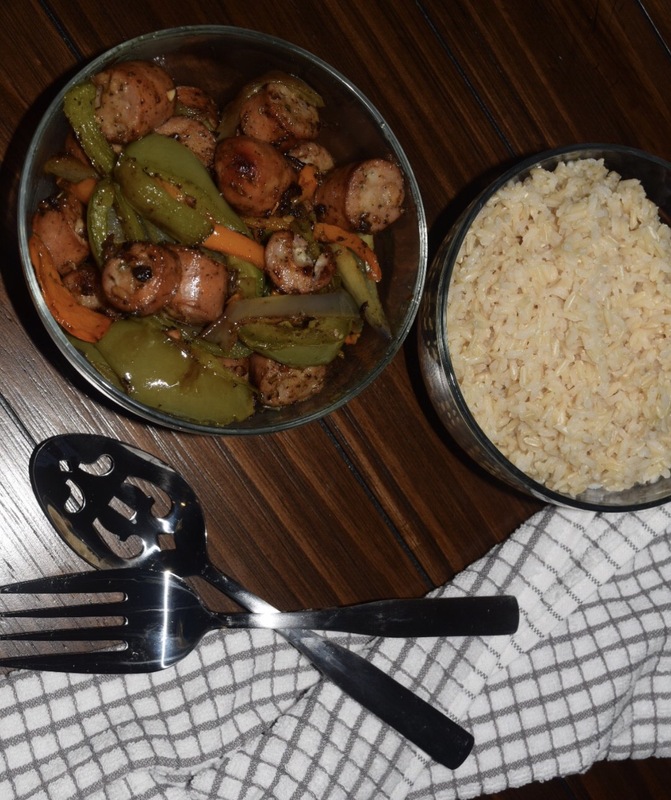 All in all, this sausage and peppers recipe was very tasty. It was quick and light–perfect for an end of summer evening. Most people would add onion to the recipe. I abhor onions, but I won’t judge you if you add them in for your version. Start with a cast iron pan (if you can). I like my sausage and peppers to get a nice char on them, and I find that’s best with cast iron. Chop your peppers however you like. I chop my Lipstick peppers in rings and I chop my Bells long and skinny. Let them cook for about 3-5 minutes or until they begin to soften. 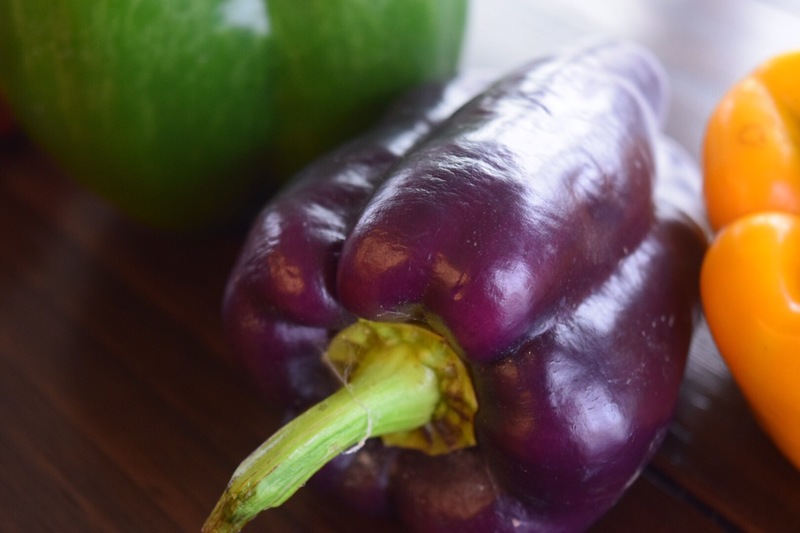 You will notice that purple peppers will lighten and orange peppers will take on a more yellowish tone. Serve over brown rice and enjoy your colorfully warm, summer goodness.